The arms feature a red rampant lion with blue tongue and claws situated within a red double border decorated with fleurs-de-lis (known as the royal tressure). The fleurs-de-lis in the royal tressure are traditionally said to represent the "auld alliance" with France, but this is unlikely, as this alliance did not come to exist until the late 13th century, when the royal tressure had been firmly established as part of the arms for many years. It was perhaps added merely to make the arms more distinctive, as the symbol of a rampant lion was already used by several lords and kings. Atop the shield sits the helm and crest. The helm is full-faced of damasked gold with six bars and features gold mantling lined with ermine. Upon the helm sits the crest, depicting the red lion, forward facing and sitting atop the Crown of Scotland, displaying the Honours of Scotland. 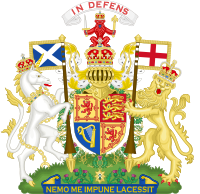 (The lion wears the Crown of Scotland and holds both the Sceptre and the Sword of State). Above the crest is the motto "In Defens", a contraction of "In My Defens God Me Defend" ("defens" being the Scots language spelling of "defence"). Surrounding the shield is the collar of the Most Ancient and Most Noble Order of the Thistle. The supporters are two crowned and chained unicorns, the dexter supporting a banner of the arms, (only in this instance is the lion depicted facing away from the lance, whereas when flown correctly the lion should face towards or respect the lance or, in most cases, the flag pole); the sinister supporting the national flag of Scotland. The compartment features a number of thistles, the national flower of Scotland. In the legend The Hunt of the Unicorn, otherwise known as The Unicorn Tapestries displayed at Stirling Castle and New York Metropolitan Museum of Art, the unicorn denotes Jesus Christ: Christ will be called the son of unicorns, for the unicorn is irresistible in might and unsubjected to man. The Hunt of the Unicorn is a love story involving Christ the unicorn, mankind and a maiden. The chained unicorn represents a risen Christ, in the garden of paradise and the chains around the unicorn represent the chains of Christ's love for the maiden and mankind. A form of these arms was first used by King William the Lion in the 12th century, though no trace of them can be made out on his seal. However, a lion rampant can clearly be made out on the seal of his son, Alexander II. Over the years many writers have claimed them to be much older; even Alexander Nisbet, considered to be one of the more reliable Scottish heralds, claims that a lion was first adopted as a personal symbol by the legendary Fergus, with the royal tressure being added in the reign of Achaius. This is clearly untrue as, even if Fergus and Achaius had existed, they predate the existence of heraldry by several centuries. Throughout the ages the arms passed from monarch to succeeding monarch with only slight variations in detail. 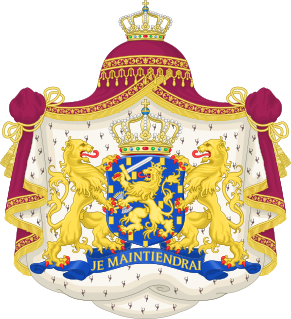 In some early examples the lion holds a sword or wears a crown, and the royal tressure has sometimes been interpreted as an orle or bordure. Many of these relatively minor variations will have resulted from the individual efforts of stonemasons, weavers, artists and sculptors throughout the ages in their attempts to create a facsimile of the arms of the period, as well as mistakes and misinterpretations on the part of foreign heraldic artists. In the reign of James III, the Scottish Parliament made a curious attempt to get rid of the royal tressure, passing an act stating that "the King, with the advice of the three Estates ordained that in time to come there should be no double tressure about his arms, but that he should bear whole arms of the lion without any more". This state of affairs does not appear to have lasted very long, with James III soon re-instating the royal tressure, first without its top, and then in its original form. "Or, a Lyon rampant gules armed and langued azure within a double tressur flowered and counter-flowered with flowers de lis of the second, Encircled with the order of Scotland the same being composed of Rue and thistles having the Image of St. Andrew with his crosse on his brest y unto pendent. Above the shield ane Helment answerable to his Majesties high qualitie and jurisdiction with a mantle or doubled ermine adorned with ane Imperiall Crowne beautified with crosses pattee and flowers de lis surmounted on the top for his Majesties Crest of a Lyon sejant full faced gules crowned or holding in his dexter paw a naked sword proper and in the sinister a Scepter both erected paleways supported be two Unicornes Argent crowned with Imperiall and goarged with open Crownes, to the last chains affixed passing betwixt their fore leggs and reflexed over their backs or, he on the dexter imbracing and bearing up a banner of cloath of gold charged with the Royall Armes of Scotland and he on the sinister another Banner azure charged with a St Andrews Crosse argent, both standing on ane compartment placed underneath from which issue thistles one towards each side of the escutcheon, and for his Majisties Royall Motto's in ane escroll over all In defence, and under on the table of the compartment Nemo me impune Lacessit." When Mary, Queen of Scots married Francis, Dauphin of France, in 1558, Mary's Royal arms of Scotland were impaled with those of the Dauphin, whose arms were themselves quartered with those of Scotland to indicate his status as King consort of Scotland. When Francis ascended to the throne of the Kingdom of France in 1559 as King Francis II, the arms were again altered to indicate his status as King of France, with those of Mary also being altered to reflect her elevated status as Queen consort of France. Following the death of Francis in 1560, Mary continued to use the arms showing Scotland and France impaled, (with a minor alteration of the arms to reflect her change of status from queen-consort to Queen dowager), until her marriage to Henry, Lord Darnley, in 1565. (Such symbolism was not lost upon Queen Elizabeth I of England, given that the English monarchy had for centuries held a historical claim to the throne of France, symbolised by the arms of France having been quartered with those of England since 1340). Following the marriage to Darnley, the arms of Scotland reverted to the blazon which had preceded the marriage to Francis. Coat of arms of James VI from 1603 as both the King of Scots and as King James I of England, France, and Ireland. On the death of Queen Elizabeth I of England in 1603, James VI, inherited the thrones of England and Ireland. The arms of England were quartered with those of Scotland, and a quarter for Ireland was also added. 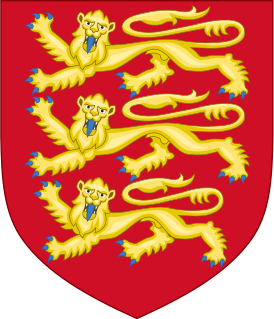 At this time the King of England also laid claim to the French throne, therefore the arms of the Kingdom of England were themselves already quartered with those of the Kingdom of France. James used a different version of his royal arms in Scotland and this distinction in royal protocol continued post the Acts of Union of 1707. (Today, the Royal Arms of the United Kingdom used in Scotland continue to differ from those used elsewhere). During the reign of King Charles II, the royal arms used in Scotland were augmented with the inclusion of the Latin motto of the Order of the Thistle, the highest Chivalric order of the Kingdom of Scotland. The motto of the Order of the Thistle, Nemo me impune lacessit, appears on a blue scroll overlying the compartment. (Previously, only the collar of the Order of the Thistle had appeared on the arms). The addition by King Charles of Nemo me impune lacessit ensured that the blazon of his Royal arms used in Scotland complemented that of his Royal arms used elsewhere, in that two mottoes were displayed. The blazon used elsewhere had included the French motto of the arms, Dieu et mon droit, together with the Old French motto of the Order of the Garter, the highest Chivalric order of the Kingdom of England. The motto of the Order of the Garter, Honi soit qui mal y pense, appears on a representation of the garter surrounding the shield. Henceforth, the versions of the Royal arms used in Scotland and elsewhere were to include both the motto of the arms of the respective kingdom and the motto of the associated order of chivalry. From the accession of the Stuart dynasty to the throne of the Kingdom of Ireland in 1603, the Royal Arms have featured the harp, or Cláirseach, of Ireland in the third quadrant, the style of the harp itself having been altered several times since. The position of King of Ireland ceased with the passage by the Oireachtas of the Republic of Ireland Act 1948, when the office of President of Ireland (which had been created in late 1937) replaced that of the King of Ireland for external as well as internal affairs. The Act declared that the Irish state could be described as a republic, following which the newly created Republic of Ireland left the British Commonwealth. However, the modern versions of the Royal Arms of the United Kingdom of Great Britain and Northern Ireland used both in Scotland and elsewhere, and also the arms of Canada, continue to feature an Irish harp to represent Northern Ireland. 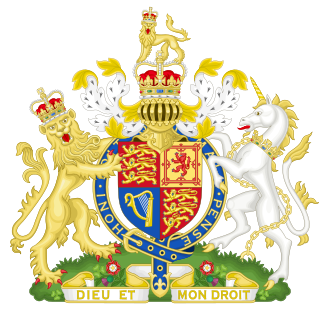 Following the accession of Queen Victoria in 1837, the modern royal arms of the United Kingdom were adopted. Since the formation of the Kingdom of Great Britain, the Scottish arms are now generally used in combination with the arms of England and Ireland. 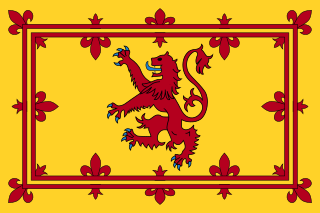 However, the original royal banner of Scotland, also known as the "Lion Rampant", continues to be used officially in Scotland; being flown from royal residences when the Queen is not in residence and used in an official capacity by the First Minister, Lord High Commissioner to the General Assembly of the Church of Scotland, Lord Lyon King of Arms and Lord Lieutenants in their Lieutenancies. Unofficially, the royal banner is often used as a secondary national flag, being most often seen at sporting events involving Scottish national teams. (Both the Scottish Football Association and Scotland national football team use a logo based upon the royal arms). The royal arms in their current form were adopted on the accession of Queen Victoria in 1837. They show the Scottish arms in the first and fourth quarters of the shield, with the English arms in the second quarter and the Irish in the third. The Scots motto In Defens appears as in the original arms, and the Latin motto of the Order of the Thistle, Nemo me impune lacessit, also appears on a blue scroll overlying the compartment. The Scottish unicorn and English lion hold lances flying the banners of St Andrew and St George, in imitation of the two unicorns in the original arms. The unicorn is placed in the dominant position on the dexter side, and the shield is encircled by the collar of the Order of the Thistle instead of the Garter. The arms of the Duke of Rothesay quarter the arms of the Great Steward of Scotland, with the arms of the Lord of the Isles. In the centre, on an inescutcheon, are the arms of the heir apparent to the King of Scots, namely the royal arms of Scotland with a three-pointed label. The royal arms of Canada correspond to the British royal arms in that they also feature the Scottish arms in the second quarter of the shield and use the unicorn as the sinister supporter. The Canadian version also mirrors the Scottish version in that each supporter not only supports the shield but also a lance displaying a flag. Both the flag and arms of Nova Scotia feature elements of the Scottish arms. 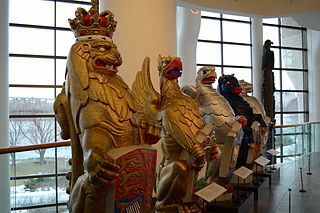 However, unlike the royal arms of Canada, those of Nova Scotia portray the unicorn as the royally crowned dexter supporter, in the Scottish style. The shield depicts an inverse representation of the flag of Scotland and features the Royal arms of Scotland on an inescutcheon. The motto munit haec et altera vincit appears above the crest in keeping with the Scottish heraldic style. (Both the flag and shield of the Lieutenant Governor of Nova Scotia also feature the Scottish arms on an inescutcheon). The royal tressure appears on the arms of numerous Scottish families and institutions as a mark of royal favour, known in heraldry as an augmentation of honour; prominent examples occur in the arms of the cities of Perth and Aberdeen. In 2002, the Queen granted arms to the Monarchist League of Canada which featured a royal tressure with maple leaves instead of the usual fleurs-de-lis. A royal tressure with roses and thistles can be found in the arms of the Marquis of Aberdeen and Temair. ^ "The Stirling Tapestries". www.stirlingcastle.scot. Retrieved 23 September 2018. ^ John McWilliam. "The Royal Arms of Scotland". The Heraldry Society.